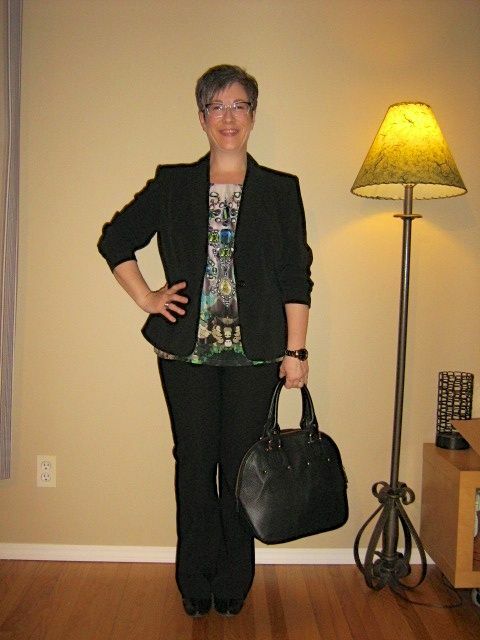 I've been searching for the perfect pair of slimming bootcut black trousers to pair with my black suit blazer so that I would have both the skirt suit that I purchased together, as well as a pants suit. Well I found them on the weekend, from Reitmans of all places! They fit my waist, bottom and hips just ever so and then lightly skim the thighs where they break into the bootcut leg at the knee. I couldn't be more pleased. Oh yeah…and the black tones match perfectly! 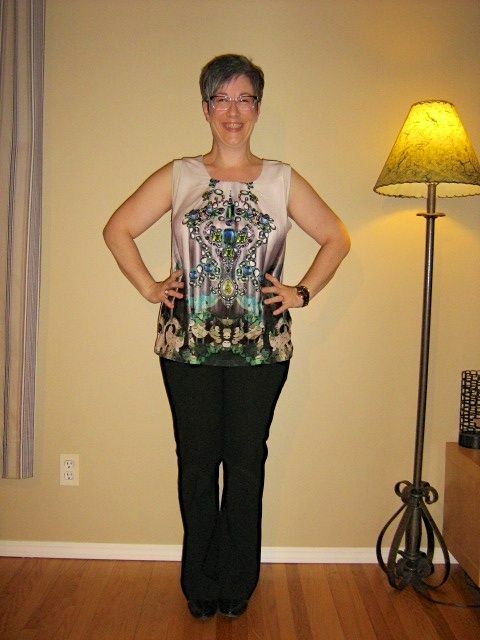 I started today's outfit with the trousers to which I added my jewelled blush silk tank. On top of that, is the black suit jacket with scrunched sleeves. 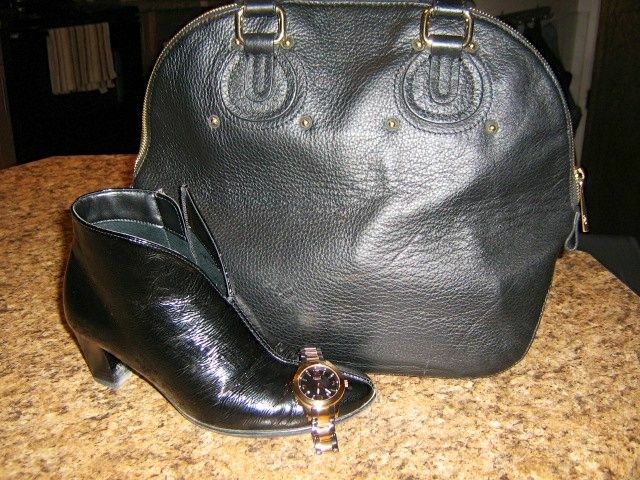 I chose my black patent booties for footwear and my black leather bag, rose gold/black watch and gold wedding band for accessories. I went with my purple/clear glasses. I feel long and lean in this - well fitting bootcuts are by far my favourite trouser and jean silhouette. What do you think? does this all work together? Corporate but not too stuffy? As always, all comments/suggestions welcome. Don't you look glorious, TS! The trousers are a wonderful fit on you and the whole outfit looks fab! Still loving the bag too! You look fab and nailed corporate-but-non-stuffy. I'm shivering looking at your bare arms though, and imagine that the jacket will stay on. The trousers look great. Love the sleek line with face-framing color and pattern. The pants are a perfect addition! I really love the blouse in this outfit. It really takes center stage paired with the subdued black ensemble. Very nice and the outfit looks great on you! Congrats on finding the perfect boot cuts! What a gorgeous tank, Shannon! Congrats on scoring the perfect pants to turn your blazer into a suit. Wow, you look amazing! Sleek and chic. The glasses you chose are the perfect touch. April - I have worn the heck out of these booties and they are holding up incredibly well. I did end up putting in a thin foam insert as I found the footbed (especially on the ball of the foot) a little bit hard. With the insert, they are a 10 out of 10 on the comfort scale. Joy - please don't worry about me shivering. With my several hot flushes per day (darn you menopause!) I quite often wear sleeveless tanks/shells under my jackets so that I can take the jacket off when I'm melting and then pop it back on once the heat subsides. leopardluxe - this blouse was one of those "love at first sight" items. It's not normally something I would choose but for some reason it spoke to me and I listened! Caramboia - this is the first time in my life I've had three pairs of glasses to choose from and I'm loving being able to switch them up to work with my outfits. Thanks for noticing. Such a stylish outfit...love the trousers! Love that blush jewel top-insert a bit of delicate feminity to a corporate look, and surely the bootcut trouser fit you perfect, no wonder you fell long and lean! 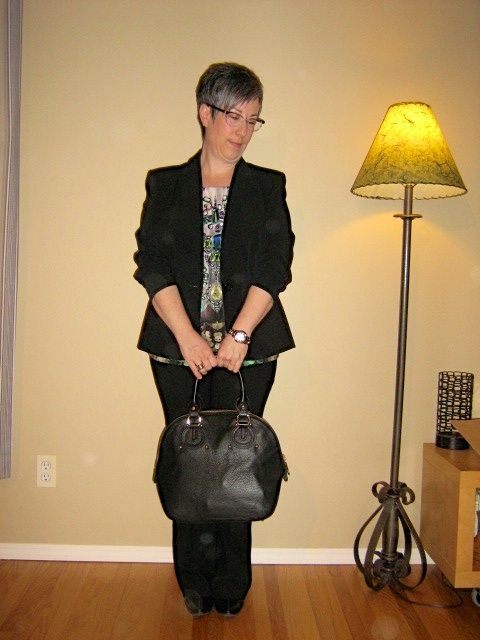 Fab AND polished office outfit, this should have been noticed! BTW, did your new coworkers already compliment you on your style? Great find at Reitmans Shannon. They are a wonderful fit! Gorgeous! I just love the personality and style that tank infuses! And way to wait for the perfect trousers. You look great! I REALLY like the silk printed top with the suit. It adds such a great dose of fun and personality while still maintaining the authority of a suit. I think i need to find something similar to go with mine. You look fab. It is so great to find that pair of trousers you feel great in. Wow - you look great! I love the tank to make the suit less stuffy and more "you". Erghhhh...how do you do this?? I want practically every outfit you have, and yet I would say that our styles and needs are different. I could wear this for sure. Yes! You do look long and lean!! Bootcuts are so magical! I love them. What a great find Shannon! Very sharp. I love the blouse, especially. Scrumptiously good fitting trousers! And that blouse too, wow, you look great! You look great in this! 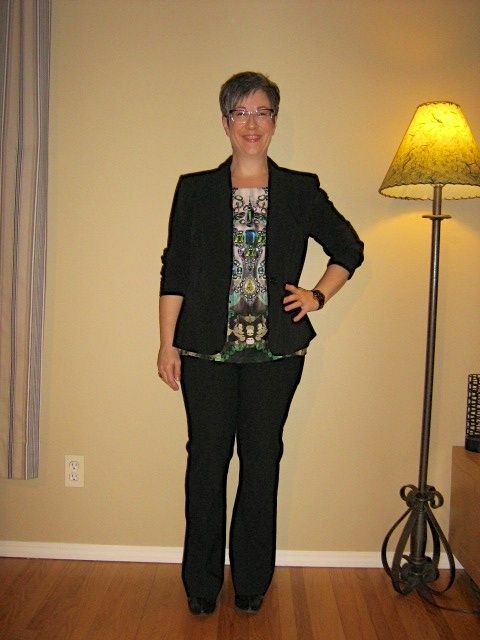 Love the long slimming line and the bit of surprising color -- and what luck that you were able to match blazer and pants from different sources! This is sooooo slimming! You are looking long and lean, and I love the blouse, the pattern is so pretty! Girlfriend, you were made for bootcuts! You look wonderfully slender in these. Fantastic! Perfect pants, the fashion holy grail! Great find. These fit beautifully and the outfit is professional and stylish. The perfectly on-trend fit of the blazer and fun print keep it from being stuffy. Gorgeous.